Sparkling wine Château Vartely is characterized by exquisite and noble colors. Saturation with bubbles, which pleases the eye for a long period after opening the bottle is an excellent addition to tantalizing aromas of grapes and citrus fruit combined with floral nuances. 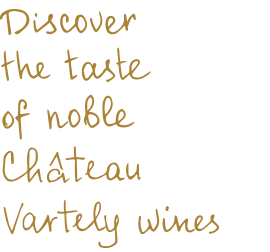 Sparkling wine Château Vartely will be perfect for any special occasion, be it a birthday party, celebrated with friends, or spectacular events, such as weddings or other celebrations. A bottle of sparkling wine should be cooled no more than 45 minutes, so that it doesn’t lose its taste and aroma.